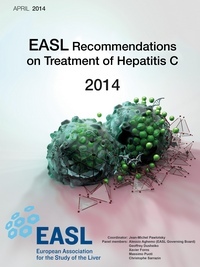 Coordinator of the EASL panel for the Recommendations on Treatment of Hepatitis C 2014. The approval of new hepatitis C virus (HCV) drugs in Europe and other parts of the world in 2014 created the need for straightforward, clinical practice guidelines issued by national or international scientific organizations. The American Association for the Study of the Liver (AASLD) decided to publish online recommendations that will be regularly updated. The AASLD guidelines essentially target the US market and its medical insurance environment. The World Health Organization (WHO) also generated guidelines that essentially cater for low- and middle-income areas. In this context, the need for clinical practice guidelines that can be used all over Europe and more broadly by any prescribers interested in evidence-based recommendations independent of local reimbursement strategies becomes evident. The European Association for the Study of the Liver (EASL) is in an ideal position to generate such guidelines. It is the leading European scientific society devoted to liver diseases; EASL organizes the International Liver Congress (ILC), the largest liver meeting in the world with a wide international attendance, and its official journal, the Journal of Hepatology, has a high impact factor and is widely read. In this context, the decision was taken to publish the new “EASL Recommendations on Treatment of Hepatitis C 2014″ online and present them at the ILC 2014 in London last April. The recommendations took only three weeks to be written by an outstanding panel of experts and were formatted and released for the opening of the ILC 2014. In addition, they were also presented and discussed during a very well attended General Session. The spirit of the EASL guidelines was to provide clear recommendations for clinical practice based on the current state of knowledge, not taking into account local limitations to therapy such as access to certain drugs and/or reimbursement policies. The Recommendations take into consideration that three new HCV drugs will be available on the European market by the middle of 2014: the nucleotide analogue sofosbuvir, the second-wave, first-generation protease inhibitor simeprevir, and the NS5A inhibitor daclatasvir. The Recommendations present several options for each group of patients. The data published to support each option is presented and the strength of the recommendation is discussed. The goal of hepatitis C therapy is to eradicate HCV infection and to prevent hepatic cirrhosis, decompensation of cirrhosis, hepatocellular carcinoma, and death. The endpoint of therapy is undetectable HCV RNA in a sensitive assay (<15 international units/mL) 12 weeks (SVR12) and 24 weeks (SVR24) after the end of treatment. An important step forward in the new EASL Recommendations is that the same treatment regimens can be used both in HIV-coinfected patients and in patients without HIV infection, because the virological results of therapy are identical. All treatment-naïve and -experienced patients with compensated disease should be considered candidates for therapy. However, treatment should be prioritized for patients with significant fibrosis (METAVIR score F3 to F4); it is justified in patients with moderate fibrosis (METAVIR score F2); in patients with no or mild disease (METAVIR score F0-F1), the indication for and timing of therapy can be individualized. The panel considered that the triple combination of pegylated IFNα, ribavirin and either telaprevir or boceprevir for genotype 1 and the combination of pegylated IFNα and ribavirin for genotypes 2 to 6 remain acceptable in settings where none of the new options are available. However, these treatment regimens are not recommended options. Six treatment options are available in 2014. Three of them are still based on the use of pegylated IFNα and ribavirin; they include the triple combination of pegylated IFNα, ribavirin and sofosbuvir (all genotypes), the triple combination of pegylated IFNα, ribavirin and simeprevir (genotypes 1 and 4), and the triple combination of pegylated IFNα, ribavirin and daclatasvir (genotypes 1, 3 and 4). The three IFN-free treatment options include k plus ribavirin (genotypes 2 and 3), sofosbuvir plus simeprevir (genotypes 1 and 4) and sofosbuvir plus daclatasvir (genotypes 1, 3 and 4). Specific recommendations are made for special groups, including patients with advanced liver disease, patients with an indication for liver transplantation, post-transplant recurrent hepatitis, patients with impaired renal function, HBV-coinfected individuals, non-hepatic solid organ transplant recipients, active drug addicts and patients on stable maintenance substitution, patients with hemoglobinopathies or bleeding disorders, and subjects with acute hepatitis C.
The EASL Recommendations for Treatment of Hepatitis C 2014 are available for download on the EASL website, together with the webcast of the ILC 2014 session and discussion (http://www.easl.eu/_newsroom/latest-news/easl-recommendations-on-treatment-of-hepatitis-c-2014) and as an e-pub ahead of print on the Journal of Hepatology website. They will appear in the July issue of the Journal. New drug combinations are likely to be approved at the end of 2014. They include the fixed-dose combination of sofosbuvir and ledipasvir in a single tablet and the triple combination of ritonavir-boosted ABT-450, ombitasvir and dasabuvir. Hence, the EASL Recommendations for Treatment of Hepatitis C will be updated before the end of 2014 and thereafter to account for the new entries to the HCV armamentarium and the most recent clinical results. We, as members of the EASL expert panel, believe the EASL Recommendations for Treatment of Hepatitis C 2014 provide an invaluable tool for easier hepatitis C treatment and broader access to care in Europe and beyond. The World Health Organization (WHO) recently released its first guidelines for the treatment of hepatitis C. The document ‘WHO guidelines for the screening, care, and treatment of persons with hepatitis C infection’ is part of an enhanced engagement on behalf of the organization to promote hepatitis prevention and treatment. These guidelines have a different focus compared to those developed by professional organizations such as the European Association for the Study of the Liver (EASL). Those guidelines provide specific guidance on the treatment of patients in different clinical scenarios, while the WHO guidelines take more of a public health approach. This means that they make recommendations all along the continuum of care – prevention of hepatitis C infection as well as diagnosis and management of patients before and during treatment. Furthermore, the WHO guidelines are meant for use primarily in resource-constrained settings where treatment coverage is very low. They are meant to guide policy makers, in those countries who are considering developing national hepatitis C treatment programmes. Another distinction of the WHO guidelines is that they follow a rigorous, evidence-based process. Each recommendation is based on a systematic review of all available evidence combined with an assessment of the quality of the evidence. There are nine key recommendations in the new guidelines. One of the barriers to treatment scale-up is that most individuals with chronic HCV are unaware of their diagnosis. Thus, WHO recommends a screening test for those considered at high risk of infection, followed by a nucleic acid test for those who screen positive, to establish whether they have chronic hepatitis C infection. Implementing this recommendation will require a significant increase in resources for screening programs including purchase of testing kits, improvements in laboratory infrastructure, and training of health-care workers in counseling. Alcohol is known to accelerate liver fibrosis, WHO advises that persons with chronic hepatitis C infection be given an alcohol intake assessment and provided counseling to reduce alcohol intake for those individuals with moderate or high alcohol use. The guidelines provide advice on the selection of the most appropriate test to assess the degree of liver damage in those with chronic hepatitis C infection. Assessing the degree of fibrosis is an important step in determining who needs treatment. After a systematic review of the relative performance of available tests including Fibroscan, low-cost serum-based tests such as the APRI were found to perform adequately and were recommended because of their lower cost and greater availability. Furthermore, patients with more advanced liver disease (METAVIR stages F3 and F4) should be prioritized for treatment, as they are more likely to develop cirrhosis or liver cancer. Despite the rapid advances in drug development for hepatitis C, in many countries the only available treatment regimen remains interferon and ribavirin. The document recommends that all individuals with chronic HCV infection, even injecting drug users, be assessed for HCV treatment, that pegylated interferon be used rather than standard interferon. The document also includes recommendations regarding the use of the new direct-acting antivirals such as boceprevir, telaprevier, sofosbuvir and simeprevrir. The 2014 recommendations also summarize for policy makers and health-care workers the interventions that should be put in place to prevent transmission of hepatitis including measures to assure the safety of medical procedures and injections in health-care settings and among individuals who inject drugs. There are many challenges to the implementation of these recommendations. These include low levels of screening, lack of trained health-care workers, inadequate laboratory infrastructure, and the high cost of these therapies. WHO will be working to overcome these barriers. This will include assistance to countries to adapt the guidelines, efforts to promote the development of generic formulations of hepatitis C medicines, and assessing the quality of hepatitis laboratory tests and the generic forms of hepatitis drugs. The European Association for the Study of the Liver (EASL), established almost 50 years ago, has traditionally been driven by the liver communities in Western and Southern Europe, the founders of this association. Over the years, EASL has grown enormously and has become a premier international association for people interested in research and education in liver disease. In recent years, following the fall of the iron curtain as well as the integration of several Central and Eastern European countries into the European Union, EASL has become a much larger community, even in Europe. As a result, EASL recognizes the need to increase its efforts to support education and research in liver disease in Eastern Europe and the neighbouring countries. The reasons for this are manifold and quite evident. First of all, the prevalence of liver disease and in particular of viral hepatitis is much higher in many of the Eastern European countries compared to Western and Central Europe (1). This means there is a large and often unmet need to tackle liver disease in these areas. Secondly, the medical systems in these countries are often not as advanced and highly specialized care is not available for a significant number of affected individuals. Thirdly, the level of education is high in some places but overall cannot keep up with the standard of medical education systems in Western Europe. Fourthly, the economic situation in many of these countries was not very good even prior to 2008 and has become worse since. This leaves less money available for all aspects of the medical system including drugs for treatment of chronic liver disease, education of physicians and adequate pay for physicians delivering specialized care. Furthermore, frequently there is a lack of political will as well as a severe lack of funds to invest in large-scale projects, like screening and treatment of chronic hepatitis B and C.
While EASL is not in a position to solve these problems, EASL has started to engage proactively in several areas where we can help our Eastern European neighbours (2). EASL is increasing its efforts to provide high-level education to physicians practising in Eastern Europe. This is achieved through our regular educational program but it has recently been enhanced through the foundation of the EASL Eastern European Focus Group, which involves highly motivated experts from Eastern Europe and the surrounding countries with a clear goal to improve medical education and research in Eastern Europe. Furthermore, EASL has been actively engaging with Eastern European members of parliament in Brussels to aid their lobbying efforts for improvements to healthcare at a European level. EASL is also actively participating in the development of ECDC’s HepFrame program. The goal of Hepframe is to provide a universal framework for governments and ministers of health in particular in Central and Eastern Europe, which would allow them to develop effective programs to address screening for viral hepatitis and access to care for patients with chronic liver disease in the context of their individual country. EASL is also setting up a program that will allow hepatologists in training from Eastern Europe to spend some time in Western European Institutions. This will allow them to gain better insight into how best practice in managing liver disease can be set up and will prepare them to implement important improvements in their home countries. Even though there is still quite a long way ahead, EASL is confident that over the next few years this will lead to an improved situation for treatment of liver disease in Eastern Europe which will alternately benefit not only patients affected today but societies on the whole in Eastern Europe. Blachier M, Leleu H, Peck-Radosavljevic M, Valla DC, Roudot-Thoraval F. The burden of liver disease in Europe: A review of available epidemiological data. J Hepatol 2013;58:593-608. Analysis of HCV screening programs in SEE/EE countries shows different approaches to the choice of target populations for screening in individual countries (except for compulsory screening of blood and organ donors in all countries). Target populations with variable inclusion in screening programs in SEE/EE countries include: pregnant women (screened in Armenia, Ukraine, Montenegro, Serbia), health-care workers (Armenia, Moldova, Russia) as well as occupational exposure groups (Bosnia and Herzegovina, Croatia, Serbia)4,5,6,7, hemodialysis patients (Bosnia and Herzegovina, Croatia, Moldova, Serbia, Russia) and persons with a history of shared injecting equipment (Bosnia and Herzegovina, Croatia, Serbia).3 Target populations with very limited inclusion in SEE/EE screening programs are: military recruits (Ukraine), family contacts (Moldova, Croatia), candidates for chemotherapy or immunosuppressive treatment (Croatia), persons with a history of long-term imprisonment (Croatia, Serbia)8, HIV-infected persons (Croatia, Serbia) as well as IVF candidates (Croatia).3 Noteworthy, surveillance of migrant populations is currently not a part of HCV screening programs in SEE/EE countries. The abovementioned data show that considerable efforts will be needed to ensure the systematic approach to the screening of high-risk populations such as migrants, intravenous-drug users, prisoners, STI clinic attendees and MSM in all SEE/EE countries for hepatitis C.
National policy related to screening and referral to care for hepatitis B is available in 50% of countries from the WHO European region.3 Mandatory testing for hepatitis B for specific groups (blood donors, health-care workers, pregnant women and patients on haemodialysis) is reported for 54.5% of the countries. Three quarters of the WHO European Region countries reported that a national policy that specifically targets mother-to-child transmission of hepatitis B includes screening of all pregnant women for hepatitis B. According to the 2013 WHO report on the European Region, national clinical guidelines for the management of viral hepatitis are available in 29 countries (65.9%).3 Countries with clinical guidelines focusing on viral hepatitis from the SEE/EE include Croatia9, Bosnia and Herzegovina, Georgia, Lithuania, Poland, Slovenia, Slovakia, Moldova, Latvia, Hungary, Estonia and Bulgaria. Thirty-nine (88.6%) countries from the European region reported that at least one available drug for treating hepatitis C is included on the national essential medicines list or subsidized by the government.3 The drugs most commonly reported were interferon alpha, pegylated interferon and ribavirin whereas inclusion of first-generation of direct acting antivirals (DAA) boceprevir and telaprevir was observed only in 38.6% of reporting countries (n=12). Restricted access to the first-generation DAAs in EE/SEE compared to Western and Central Europe is mainly associated with high treatment costs. The majority of patients from SEE/EE was treated with first-generation DAAs as a part of expanded access programs funded by the pharmaceutical companies in Croatia, Poland, Romania, Slovenia, Slovakia, Hungary, Estonia, Serbia and Bulgaria. Additionally, significant delays are observed between EU registrations of DAAs and national reimbursement decisions in SEE/EE. For example, reimbursement for first-generation DAAs in Romania, Estonia, Russia and Bulgaria is expected in 2014. Second-generation DAAs, most importantly sofosbuvir and simeprevir, are currently unavailable in the SEE/EE. Due to the high predicted costs of the treatment regimens that include second-generation DAAs as well as future IFN-free regimens (>85 000 USD), it is reasonable to assume that the new treatment options will be available to patients in the SEE/EE exclusively via expanded access programs for some time to come thereby increasing the treatment gap between Eastern and Western Europe. National health insurance funds cover, at least in part, the price of hepatitis C and hepatitis B treatment (including diagnostic monitoring) in the majority of countries in SEE/EE. In reality, access to treatment is restricted due to the financial limitations of the national health insurance funds. Patient’s financial contribution and/or additional state or private healthcare insurance is required to provide hepatitis treatment in many countries in the region. Importantly, insurance schemes in some countries do not cover unemployed individuals, thereby excluding a large portion of intravenous drug users that carry the largest burden of infection in the region. Some countries requested funding from international donors (Global fund, World Bank) but this covered only a small portion of overall treatment need (some programs were aimed at HIV/HCV coinfected persons and needle exchange programs only). Removal of obstacles to excellence in viral hepatitis clinical care in SEE/EE will require close collaboration between the government, physicians, patients and pharmaceutical companies. Governments are expected to develop comprehensive and coordinated national strategies on hepatitis C that integrate prevention, surveillance, testing, treatment, care, support, training and awareness-raising efforts (legislative framework), play a more active role in harmonizing efforts on governmental and non-governmental levels and activate government mechanisms aimed at the reduction of pharmaceutical spending in the field of hepatitis C. Physicians are required to provide leadership in the creation and implementation of national prevention, testing and treatment policies on hepatitis C. They should develop national guidelines on the clinical management of hepatitis C in order to ensure that the most effective treatment regiments are included in the list of subsidized/reimbursed medications. They are expected to play an active role in the training of specialists, family doctors and other medical professionals involved in hepatitis C treatment. Patients’ advocate groups can contribute via collaboration with government and medical professionals to ensure the patient’s perspective in national hepatitis C policies. They can also provide leadership in public awareness campaigns on hepatitis C (particularly in the context of stigmatization) and in efforts to promote point-of-care testing as well as by collaboration with pharma companies in efforts to promote compassionate use of DAAs. Continued EU and WHO coordinated efforts will be needed to harmonize the access to treatment in Western and Eastern Europe. Good national plans that include clever screening programs for populations at risk are needed. Scaling-up of HCV screening programs is required for healthcare planning in Eastern Europe, particularly in providing economic estimates during negotiations with various stakeholders and assisting patients’ organizations to gain the public awareness of chronic hepatitis C as a curable disease. Despite the clear benefits of DAAs in providing a cure, treatment costs are likely to remain an important obstacle to achieving excellence in HCV clinical care in Eastern Europe. Hope VD, Eramova I, Capurro D, Donoghoe MC. Prevalence and estimation of hepatitis B and C infections in the WHO European Region: A review of data focusing on the countries outside the European Union and the European Free Trade Association. Epidemiol Infect 2014;142:270-286.
WHO: Global policy report on the prevention and control of viral hepatitis in WHO member states 2013, http://www.who.int/csr/disease/hepatitis/global_report/en/ (accessed May 19th 2014). Ahmetagic S, Muminhodzic K, Cickusic E, Stojic V, Petrovic J, Tihic N. Hepatitis C infection in risk groups. Bosn J Basic Med Sci 2006;6:13-17. Čavlek TV, Margan IG, Lepej SZ, Kolaric B, Vince A. Seroprevalence, risk factors and hepatitis C genotypes in groups with high-risk sexual behavior in Croatia. J Med Virol 2009 2009;81:1348-1353. Kolaric B, Stajduhar D, Gojnik D, Rukavina T, Wiessing L. Seroprevalence of blood-borne infections and population size estimates in a population of injecting drug users in Croatia. Cent Eur J Public Health 2010;18:104-109. Telaku S, Fejza H. Prevalance of HBV and HCV among blood donors in Kosovo. Virol J 2009;6:21. Burek V, Horvat J, Butorac K, Mikulic R. Viral hepatitis B, C and HIV infection Croatian prisons. Epidemiol Infect 2010;138:1610-1620. Vince A, Hrstić I, Begovac J, Bradaric N, et al. Viral Hepatitis. Croatian Consensus Statement 2013. Acta Medica Croatica 2013;67:263-272. Plan now to attend the AASLD/EASL Special Conference on Hepatitis C, September 12-13, at the Sheraton New York Times Square Hotel in New York City. The American Association for the Study of Liver Diseases (AASLD) and the European Association for the Study of the Liver (EASL) have collaborated to put together an outstanding program featuring distinguished faculty from around the world. The goal of this event is to provide attendees with the most up-to-date information to inform their practice in hepatitis C (HCV) testing, management, and treatment. The rapid development of new treatments makes this special conference particularly timely. It is designed to provide attendees with the tools to help evaluate new screening strategies and the strengths and limitations of recently approved therapeutic regimens; understand the changing global epidemiology of the virus; and to understand barriers to care and identify potential solutions to improve global access to HCV therapies. Several exciting new therapeutic regimens will become available for patients within the next 6 to 18 months. These treatments will substantially change the paradigm for management of HCV. There is a lot of new information to communicate, which is why AASLD and EASL have partnered to create this conference. This collaboration recognizes the international nature of the massive effort to cure HCV on a global scale. The conference was designed to encourage a lot of interaction between speakers, moderators, and the audience. Part of the meeting will be devoted to public health issues and the implications of HCV: for example, screening for HCV to identify undiagnosed individuals, the cost implications of new treatments, and how costs can be managed in an era of limited resources in order to maximize access for HCV therapies. As the course organizers (Adrian Di Bisceglie, MD; Michael W. Fried, MD; Alessio Michele Aghemo, MD, PhD; and Darius Moradpour, MD), we developed the program with the goals of evaluating the impact of new strategies for screening of HCV around the world, understanding the changing global epidemiology of HCV infection, evaluating the strengths and limitations of newly approved therapeutic regimens, and identifying barriers to care and identify potential solutions to improve global access to new HCV therapies. We cordially invite you to join us in New York City, September 12-13 for the AASLD/EASL Special Conference on Hepatitis C to interact with healthcare professionals from around the world. Space is limited—reserve your seat today and get more details on the location and speakers at www.aasld.org. MEETING ANNOUNCEMENT: Optimal Management of Hepatitis B Virus Infection, 25-27th September 2014, Athens, Greece. The management of chronic HBV infection has improved substantially over the last 15 years, but still remains suboptimal as the virus cannot be usually eradicated. The variability of viral strains and heterogeneous course of disease in different regions of the world, together with the absence of curative treatment options, impose a number of dilemmas and challenges in every day clinical practice. This two-day meeting will focus on all clinical aspects of the management of chronic HBV infection, but will also cover some basic topics of HBV virology and immunology that will inform future therapeutic advances. Experts from both Europe and Asia-Pacific area and a few guests from North America will provide the latest data and expert opinions. Some of the key topics to be covered will include HBV epidemiology, virology, immunopathogenesis, natural history, treatment indications and end-points, optimal current treatment approaches and their challenges in chronic hepatitis B patients, including special groups, and finally innovative prospective treatment options. The format of the programme aims to generate active discussions and interactions, to reveal similarities and differences between different patient populations, to reach widely accepted conclusions that will improve patient management, to highlight the unmet medical needs and ultimately to guide preclinical and clinical research in this field. Thus, all clinicians and scientists are encouraged to participate actively in the discussions during the round table sessions as well as to submit and present their data in the poster sessions.